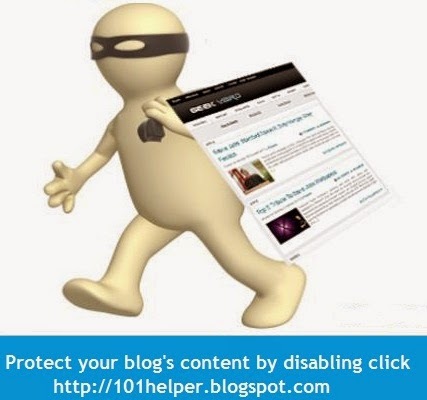 Protecting content from copy in blogger, how to protect content in blogger, Disable right click in blogger,Disable left click in blogger,Disable right/left click in blogger,Disable click on specific text in blogger, 101Helper blogger tricks. A blog's content is its everything and people visits a blog only for meaningful content. A blog having a unique and meaningful content is more popular than a blog having copied content. But its not easy to create unique content therefore some bloggers copy unique content from other blogs and publish it on their blogs which results in a bad effect on the victims blog. When content of a blog is copied its value decrease as well as its traffic rate also decreases. A few days ago someone copied my seo posts and published it on his blog so I thought to prevent this in future therefore I disabled right/left click in my blog so that nobody could copy my content. But Disabling right/left click on blog is good for those blogs who do not offer their visitors to copy a code(tutorials for blogging) but what about those blogs which offer its visitors to copy a code or text? therefore I used a trick to block click on specific text so now a visitor will be able to copy code of a gadget/widget. You can see a demo here. In this post I will show you how to disable both right and left click in a post, how to disable only right click in post and how to disable click on specific text to prevent your content from copy. So first lets start from disabling text on specific text. (1). First of all edit the post in which you want to disable click. This is a text paragraph. Here you have to put the html attribute above the paragraph and at the end of this paragraph you have to close this html tag by </div>. Don't forget to close it otherwise it will not work. I would suggest you to use notepad++ to do this because it makes easy to edit code. So download notepad++ first and after that you have to copy whole code of the post and paste it in notepad++.</div>. In the above example I have added the html attribute above the paragraph and closed it by </div>. (5). Save the post after making changes and you are done. This code only disables left click on specific text and if you want to disable both clicks use below code to disable the right one too. Its a hard working process but you have to do it to prevent your content to be copied. Download notepad++ to make it simple. Note: If you blog isn't accepting your code and displaying a <div> error then it means that you haven't done it properly therefore always keep a backup before making any change. If you wish to disable right click in a specific post then copy below code and after writing the post switch to Html tab and at the end of the whole code paste it. If you have any question feel free to ask me. Follow and subscribe to get latest news about blogger tricks. Share this post with others and help 101Helper spread. Give me your feedback or suggestion by leaving a comment below. Search tags: Protecting content from copy in blogger, how to protect content in blogger, Disable right click in blogger,Disable left click in blogger,Disable right/left click in blogger,Disable click on specific text in blogger, 101Helper blogger tricks. I'm really interested of it. But. I know always this but.. i have some fragments of text that it need to be able to copy. Is there any way to add exception for option java for whole site? All text that need to be copied is in personalized blockquote (and its made in css). Yes you can use the above code to block clicking and selecting is a specific area. But if you want to block both left and right click on your blog post and allow some area to be selectable or clickable then you can embed it from an external source like Google Drive. And if you want to block click on a specific post and not on all posts of your blog then simply copy the above code, go to your post switch to html, paste the code and publish your post. I hope you got me. If you still have any problem please let me know!